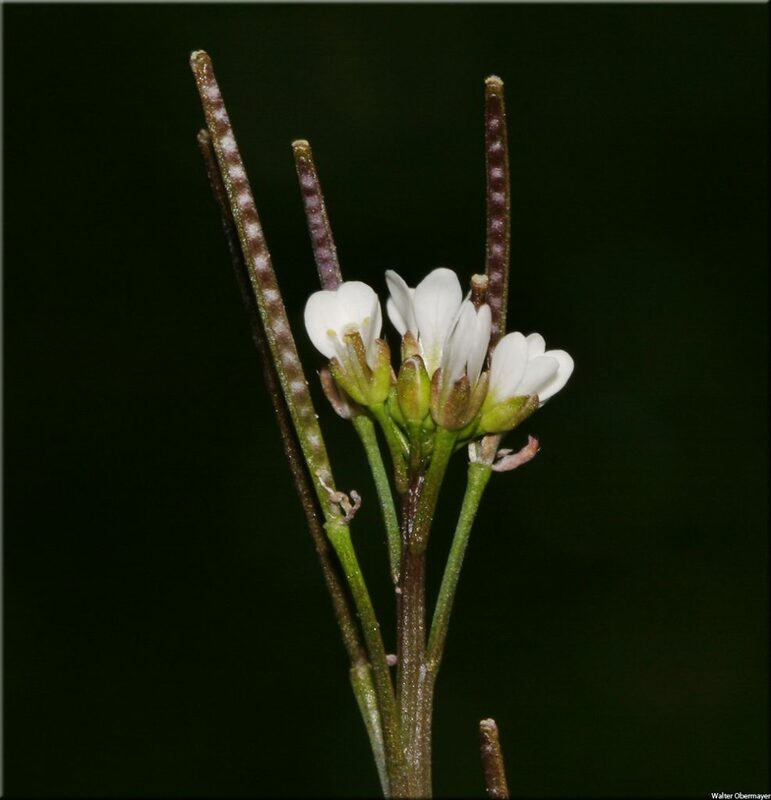 Cardamine hirsuta.Leo Michels.Luirig.altervista.org. (Accessed 5/2014). Cardamine hirsuta is an annual, winter annual herb, stem 10-40 cm tall, smooth. Name hirsuta is rather misleading since this plant looks hairless without a lens. Even then, hairs are sparse. Leaves alternate, mostly in a dense basal rosette, pinnate, leaflets rounded, short-stalked, terminal leaflet larger, often lobed, stem leaves few, inconspicuous, becoming narrower towards top of stem, leaf stalks hairy, at least at base (use lens). Cardamine hirsuta flower. Carl Farmer. www.nature-diary.co.uk.jpg (Accessed 12/2014). 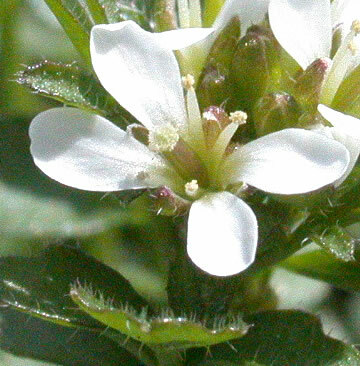 Flowers white, 4-parted, petals 0.2-0.3 cm long, sepals green, shorter; inflorescence crowded at top of a gradually elongating stem with a few small pinnate leaves; blooming March-April. Fruit green, often purplish, eventually becoming dry, capsules linear, to 2.5 cm long, developing below flowers on the elongating stem. the uppermost fruit often longer than the inflorescence; . Cardamine hirsuta developing fruit. Walter Obermayer.www.uni-graz.at.2.jpg (Accessed 12/2014). 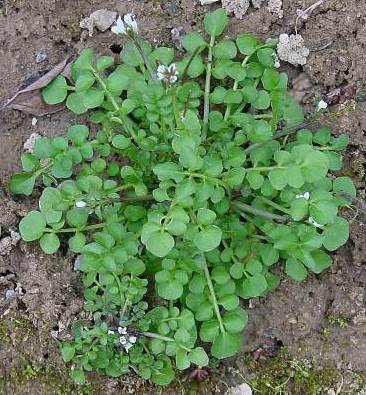 Habitat: Lawns, gardens, weedy areas, open moist soil. Notes: Very common agricultural, nursery, and garden weed outside NYC, often forming mats of seedlings and small plants (Altland 2006).